Engineering : One simple word but still is very wide in its own. The word “engineering” derives from the Latin words ingenium and ingeniare, meaning “cleverness” and “to contrive, devise,” respectively. As we all know how the technological advancement has taken the world by storm. This technological advancement has uplifted engineering solutions upto a great extent. Every aspect of such modernization demands engineering solutions to come up with best ideas. So now there is no doubt remaining why this filed has expanded and gained so much importance in India. Engineering stream is at its peak at current stage. 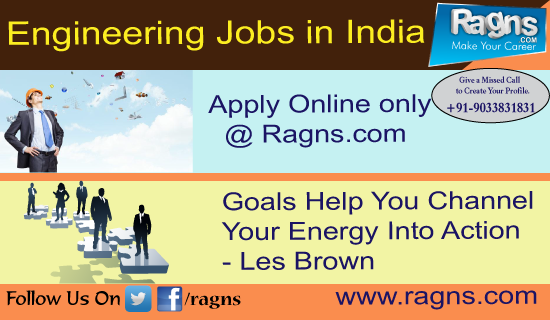 Lots of youngsters are now planning to make a career in Engineering and are looking for engineering jobs in India. As a student considering your options for college or university, the choices can be overwhelming. Students are having a wide variety of options available in engineering as there are multiple sub streams that are present here. Some of the common sub streams are mechanical, electrical, computer, aeronautical engineering and lot more. Wondering why majority of students are keen to build their career as an engineer. Well its because of high paying jobs, low unemployment ratio, endless prospects. With the rising demand of engineering has facilitated the rise of engineering colleges as well. Students now have lot of opportunities to pursue their career in engineering. There are lots of colleges, universities and institutes that offer engineering studies and courses wherein students can pursue the course of their choice and can excel to make an excellent career in engineering. Selecting an appropriate stream is totally ones choice and it’s best to follow your own personal interests. Now that you have successfully opted a suitable engineering stream the next task lies in successfully completing it which is quite obvious. After the completion of engineering, now comes the most important part i.e looking for jobs. It is quite obvious that each and every engineering graduate is not aiming to start his own business. Looking for jobs and landing in your dream job is definitely an uphill task. Getting job with specific requirements and specific location is not an easy task until and unless you don’t use proper channels for research. There are many companies in India that provide engineering services. While finding the best company is not an easy task, you need to consider several things and pick out the consulting company according to your requirements. There are lot of things to remember before opting a company. There are lot of job portals available in India. You have to opt for best portal which excels your expectations. One such name is Ragns. We help match the right ability with the right prospect more often than any other site. Ragns is highly reputed job search site and has numerous collaborations with organizations of high esteem. These collaborations help provide the jobseeker with a job he/she has been looking for. With our vast database we provide relevant profiles to employers and relevant jobs to jobseekers.